As President Trump begins taking the final steps to enforce the repeal of DACA indefinitely, there is a plethora of college students, specifically on UVA grounds, who will be adversely affected. The Deferred Action for Childhood Arrivals was established by President Obama during his first term in 2012. It allows for children who came to the United States illegally as minors to remain within the states for a renewable two-year period. DACA is currently maintaining the livelihood of at least 800,000 immigrants within the United States. After completing the above tasks along with many others, applicants may or may not be granted deferred action. Undertaking a more personal and close to home approach, the repercussions of the DACA repeal directly affect the UVA population. As a University, there are numerous DREAMers on grounds whom could potentially be disturbed by President Trump’s intentions to dispose of the policy. The latest in DACA news comes from President Trump’s proposal on October 9th to sustain the stay of DREAMers in exchange for stricter immigration laws. What does this mean for DREAMers? President Trump has until March to decide whether or not to pull the plug on DACA, but this new proposal is potentially appealing to students and minors already in the United States and protected by DACA. In his newest proposal he says that he will: sustain all 800,000 DACA immigrants, as long as, a wall is built on the southern border, hire 10,000 new immigration agents, restrict asylums, and eliminate “sanctuary cities” where officials are unable to ask locals of their immigration status. This proposition comes at the cost of hundreds of thousands of other potential immigrants while maintaining the current individuals in the United States. Both are equally important to the diversity and uniqueness of the Unites States, yet President Trump is asking for officials to choose either DREAMers or future citizens. Which is the lesser of two evils? Will DACA be sustained, or will immigration rates hit an all-time low? There is a populace of students and staff that are under the impression that DACA solely applies to the Latinx population. In truth, the Deferred Action for Childhood Arrivals policy affects minors from a surfeit of countries around the world. While the top country of origin for DREAMers is Mexico, there are scholars from the likes of South Korea, Colombia, Tobago, Pakistan, and many more on grounds at UVa. Since President Trump’s public statement of discontinuing DACA, the President at the University of Virginia, Teresa Sullivan, distributed a letter to the entirety of the student body showing her support for Dreamers on grounds and opposition to Trump’s course of action. 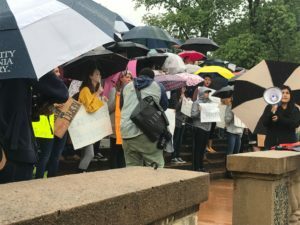 Students have united in public demonstrations, distributions of supporting posters, and offerings of moral support to their classmates being threatened by DACA’s withdrawal. The indecision on repealing or renewing DACA has left many DREAMers fearful and suspended in angst. Though their malaise may not be on display, UVA scholars are facing the real possibility of a forced exit from not just the university but also the states as a whole. Students are trapped in a time of little governmental succor and suffocating anticipation.